The old days of security cameras used to be a hassle. Long, obtrusive wires once crisscrossed homes and made it difficult to keep a home looking nice. Anyone hoping to install a security system had to face facts: they were going to have to find solutions for all the wiring involved. Today, that’s not as much of a problem. More and more people have moved toward wireless security camera systems. But how do they work? Security cameras have significant benefits, but also a few limitations. Still, they’re in higher demand than ever. Analog cameras send out constant data streams during transmissions while digital cameras adjust their signals to avoid interference. Analog cameras tend to pick up more interference, and because they are a little less secure, the signal can be picked up with a receiver that is tuned to its frequency. Digital cameras adjust their frequencies, making it harder to tune into their signals. It also means you’ll have to appropriately pair your receiver with the camera so that the two are always working on the same frequency. 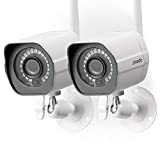 Wifi surveillance cameras operate on a network and can actually be used along with other devices and cameras when they are all networked together. These devices are all connected through a route, which sends information back and from the devices through the internet and to your receiver. A big benefit of Wifi surveillance cameras is that you can remotely tune into your video feed even when you’re outside the network, so long as you have a device that has appropriate access. Cellular devices, on the other hand, connect to a cellular network through a cellular transmitter. These transmitters send the video. While these networks operate much the same as a WiFi network, they rely on the strength of their cellular signal to operate effectively, rather than a WiFi signal. If you don’t have access to a WiFi Network, this may be your best option, though you’ll also need a cellular data plan. Wireless security cameras are easier to install than wired systems. However, wireless home security cameras can be a little less secure than wired cameras if they’re not operated properly. Still, if yours is set up the right way, you’ll have a secure connection that can be remotely accessed in a way that wired systems cannot. Regardless of whether you choose a WiFi or cellular security network, wireless systems are the way to go for just about everyone with either WiFi or cellular access. Each year, there are over 2.2 million burglaries in the US, which means that every 15 seconds, a burglary is committed. Are you ready to make your home even more secure? Don’t let your home stay vulnerable to burglars. Get in touch with Protect America for a free quote and more information about how to get started on creating a secure wireless security network in your house.